I have traveled around the world and back. And most of the time I stayed in hostels. (The only time I didn’t was when I wasn’t paying for the room). I have stayed in sketchy hostels in China (and good ones, too), with a family in Mongolia, in corporate hostels in Europe – I stayed on a hostel boat in Gent! I’ve seen a lot of rooms, and I thought I might as well share some of my insights. Here is how to travel on the cheap. Though I have traveled many places, I’m one of those people (like many Americans) who has to know where I’m staying. What I’m doing – that I could care less about – but if I arrive somewhere and don’t have a place to go to stay and drop off my bags, I freak out. I’m cheap. But that isn’t the real reason I wanted to stay at hostels. On my most recent whirlwind tour of the world I was traveling solo most of the time. And so I wanted to stay at hostels to meet other travelers and get a more personal, local experience on the city I was in. Even though I booked hostels beforehand (usually on hostelworld because I had a discount card that eliminated booking fees), there were things that I always looked out for, and anyone traveling should do so as well. Lockers in the dorm rooms: As I always stayed in dorms – again, a combo of price and the ability to meet others – I always looked for places that had lockers in the dorm rooms for personal items, and whether or not they provided locks. My advice – before you go city hopping in Europe – bring a lock. It saves the hassle of finding a lock in a city where you aren’t familiar with the shopping. 24 hour check in: There were some moments when I was traveling when my train got delayed or I got horribly turned around – so I arrived at the hostel really off of my estimated time. I usually had an international cell phone with a local SIM card, but not until the second day I got to a given place, most of the time. I always felt guilty telling the hostel a specific time and then arriving a few hours later. And then there are some hostels that will cancel your booking if you’re more than a few hours late, too! Size of the hostel: When I could, and there wasn’t a massive price difference, I tried to stay in smaller hostels – not the ones that had the 50 bed dorm rooms and had a few of them. I liked the personal feel, the quirkiness. And usually if you stay at a smaller hostel, it’s often run by locals. 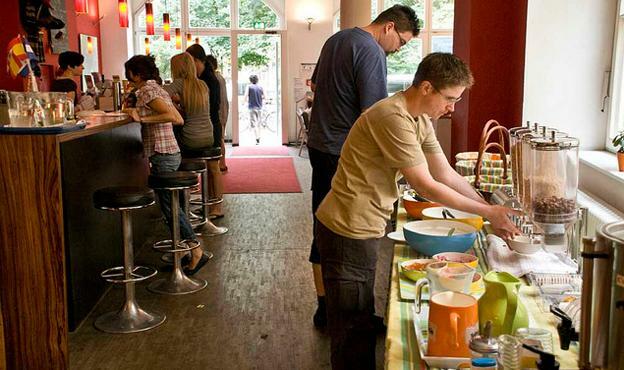 I stayed at a hostel in Berlin that was honestly one of my best experiences – there were maybe a dozen beds in the hostel – and as well as cheap breakfast and free wifi, they arranged outings in the neighbourhood – usually involving food or alcohol – or both. Reviews: Mind you, there are some people who will go out of their way to negatively review a hostel – perhaps because they were expecting everything that they would get from a hotel – but take a look not only at the quality of the reviews, but at the quantity. If a hostel only has 5 reviews and all of them are good, thats slightly different than a hostel that has 500 reviews and 10 of them are bad. Those are some of the most important factors to me when determining where to stay when I book beforehand. And if I get there and I don’t like the feel of the place, there is always the opportunity to find somewhere else to stay. And when you get to a place, you can without a doubt find that you got more than you bargained for. There was a great place that I stayed in Hangzhou, China, where they didn’t say anything about the massive back deck or these cute little coy ponds with power outage lights – you know, the lights that are motion sensitive, so they’d turn on when you got close enough and illuminate the pools? It was a nice surprise, to get somewhere with a better atmosphere than I expected. Long story short – when you get to a hostel that you booked online you can get more than you bargained for – in either sense. Usually in the good way, but sometimes in the bad way. Be prepared, and just roll with it. Alice Sweeney the author of the “Travel on the cheap and keep all your stuff” is a writer for an international consulting company. She has written about everything from gardening to electric units and power outage lights. She keeps life exciting by traveling when and how she can – locally or internationally.